On Friday, Vice-President Mike Pence became the first vice-president or president to address the March for Life in its 44-year history. 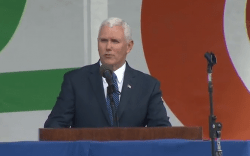 “Life is winning in America,” Pence boomed to a thrilled exuberant crowd. “Life is winning again,” he repeated. “We will not rest until we restore a culture of life in America” Mr. Pence said, a statement that was met by deafening cheers. “We will continue to win the hearts and minds of the rising generation if our hearts first break for young mothers and their unborn children,” he promised. The importance of a senior administration official — the vice president himself no less — addressing the March for Life, and the support the march has received from Trump himself cannot be overstated.